Read articles about KidSpirit and its teen writers, find out about new awards we have received, and get up-to-date with our latest press releases. Press Release: KidSpirit’s Spring Issue Highlights Youth Writing, Artwork, Poetry, and Video on Society and the Individual! Press release about the spring issue. Press Release: Global Youth Probe the Nature of Reality and Perception in KidSpirit's Winter Issue! Press release about the winter issue. Press Release: KidSpirit, Award-Winning Publication By and For Youth, Releases New Volume! Press release about The Best of KidSpirit, Volume V.
KidSpirit is excited to celebrate the 2018 KidSpirit Awards in New York City on November 13th. Read more about this exciting event. Press Release: Teen Writers and Artists Dive into The Adventurous Spirit in KidSpirit's Fall Issue! Press release about the fall issue. Press Release: Young Writers, Artists, and Poets Recognized by Peers with 2018 KidSpirit Awards! We are delighted to announce the winners of our annual KidSpirit Awards. Read the press release for more details, and see a full list of winners below! Press Release: Young Writers and Artists Delve into Storytelling and Narrative in KidSpirit's Summer Issue! Press release about the summer issue. Press Release: KidSpirit’s New Initiative Shares Global Youth Voices through Video! Press release about KidSpirit Shorts. Press Release: Young KidSpirit Contributors Explore Life at the Speed of Now in Spring Issue! Press release about the spring issue. Press Release: Spirituality & Practice has selected 10 Years of KidSpirit as one of the 50 Best Spiritual Books of 2017! Read the full press release here. Press Release: Youth Around the World Take On Creation and Destruction in KidSpirit's Winter Issue! Press release about the winter issue. 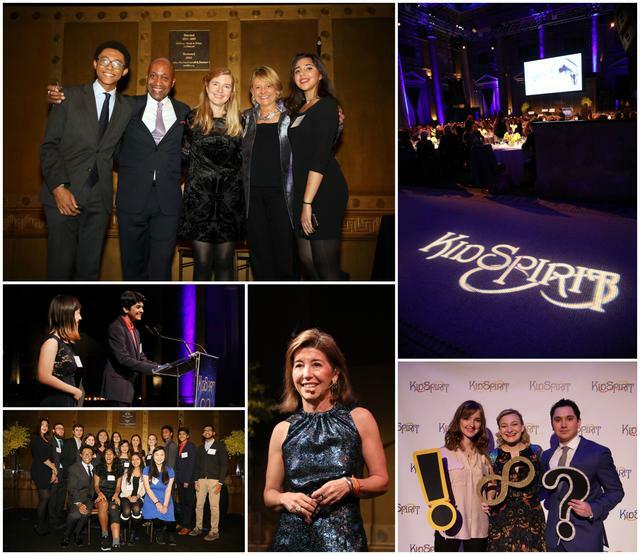 On November 9, KidSpirit celebrated its 10th anniversary with editors, friends, and supporters at Capitale in New York City. The event was chaired by Board member Karen Humphries Sallick and honored two outstanding individuals: Patrick Gaston, President and CEO of Gaston Consulting, and Laura Walker, President and CEO of New York Public Radio. Alumni and participants from Pakistan, India, New Zealand, and across the U.S. joined us to mark the milestone, perform readings, and give incredible speeches. Thank you to all those who made this magical evening such a success! KidSpirit Founding Editor Elizabeth Dabney Hochman interviewed on Spirit Matters! Listen to this fascinating conversation here. School Library Journal recommends 10 Years of KidSpirit, an anniversary anthology volume that will be released in November! Read the full review here. Press Release: Youth Around the World Discuss Unity and Division in KidSpirit's Fall Issue! Press release about the fall issue. Press Release: Youth Editors Recognize Global Teen Writers, Poets, and Artists with 2017 KidSpirit Awards! We are proud to announce the winners of our annual KidSpirit Awards. For more details, check out the press release, and see a full list of winners below! Press Release: Young Writers, Poets, and Artists Take On Resilience in KidSpirit's Summer Issue! Press release about the summer issue. KidSpirit writers who contributed to the Climate Change: Tending Our Planet issue were interviewed for the Garrison Institute's Climate, Mind, and Behavior podcast! Click here to hear young members of our community from the U.S., China, India, and New Zealand weigh in on this critical topic. Press Release: Global Youth Explore Simplicity and Complexity in KidSpirit's Spring Issue! Press release about the spring issue. KidSpirit wins a fourth Wilbur Award! We're delighted to be kicking off a milestone year with recognition from the RCC for our anthology 10 Years of KidSpirit, which celebrates a decade of extraordinary work by teens around the world. To learn more please click here. Press Release: Teens Delve into Mysteries of the Universe in KidSpirit's Winter Issue! Press release about the winter issue. This summer and fall, KidSpirit Award parties were held around the globe! Winners received micro-grants to celebrate their achievement with friends and family in their communities. 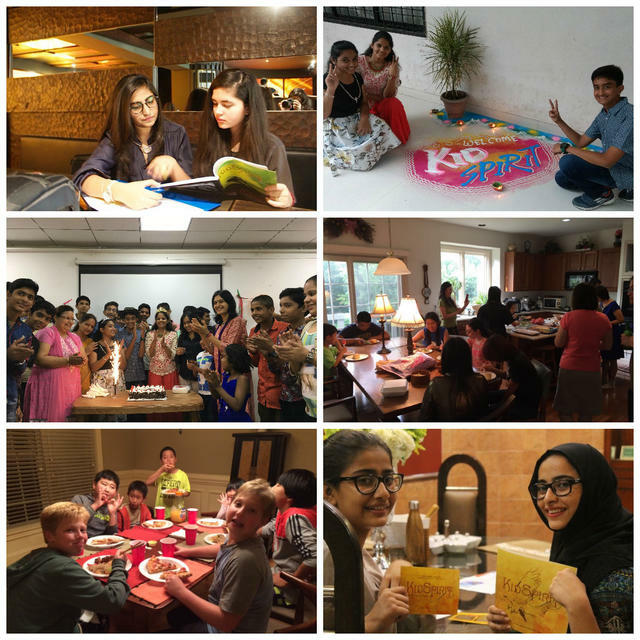 Events were held in Michigan, North Carolina, Mumbai, Karachi, and Lahore, and each one highlighted the depth and strength KidSpirit voices. One editor in Pakistan told us that her guests showed "a lot of appreciation for the way kids around the world are thinking about and exploring issues which even adults find hard to talk about." Another shared, "In my speech I described my beautiful journey with KidSpirit which ended with a party and an award this year. My friends were impressed by knowing the changes this platform has caused in me." In India, editors felt so strongly supported by their peers around the world that they said it was as if “the online magazine had jumped out of the screen and become live!" Press Release: 2016 KidSpirit Awards Highlight Inspirational Youth Voices! KidSpirit is proud to announce the winners of our annual KidSpirit Awards, selected by a network of young editors around the world. Read more in the press release, and see a full list of winners below! We're delighted to announce that KidSpirit has received the 2016 Religion News Association (RNA) Award for Magazine Overall Excellence! In an unprecedented decision, the RNA, a national association for professional journalists, honored our young writers and artists alongside major media outlets, including the New York Times, the Washington Post, and CNN. Read more about this exciting news here! Press Release: KidSpirit's New Website Showcases Youth Voices With Issue on Human Dignity! Press release about our exciting website redesign and fall issue. Press Release: Young Writers Explore Happiness in KidSpirit’s Summer Issue! Press release about the summer issue. More, here! Press Release: KidSpirit and Spirituality & Practice Partner to Highlight Youth Voices. Read the press release about our exciting new partnership with S&P, including the launch of a blog and 30 days of teen poetry and artwork! Press Release: Young Writers Traverse the Theme of Myth and Magic in KidSpirit’s Spring Issue! Press release about the spring issue. More, here! In February 2016, members of the Lahore Satellite Editorial Board met with delegates of the US-Pakistan Interreligious Consortium (UPIC) to discuss how KidSpirit is fostering change in Pakistan. Reverend Bob Chase, Founding Director of Intersections International, and Melody Fox Ahmed, Assistant Director for Programs and Operations, Berkley Center for Religion, Peace, and World Affairs at Georgetown University, both highlighted KidSpirit’s work and vision in their blog posts about the experience! Read Reverend Chase's post, Returning from Pakistan, and Melody Fox Ahmed’s post, Aahang: The Sublime Music of Pakistan. This amazing video by Intersections International features Satellite Editors in Lahore sharing KidSpirit’s impact on their country with representatives of the US-Pakistan Interreligious Consortium (UPIC). Click here to watch! Press Release: Young Writers Uncover Their Origins in KidSpirit’s Winter Issue on Heritage! Press Release about the spring issue. KidSpirit editors Nimai Agarwal and Skyler Sallick spoke about their experiences at the 2015 Parliament of the World’s Religions in Salt Lake City, a global gathering of over 10,000 people from all faiths and traditions. Watch the video here! Deseret News publishes an article about KidSpirit’s panel at the Parliament of the World’s Religions, which featured young editors Nimai Agarwal and Skyler Sallick. Read How to Help Teens Find Their Voice in Faith Communities to learn how KidSpirit’s model promotes authentic youth engagement with life’s big questions. Press Release: KidSpirit, sole spiritual magazine by and for youth, to present at Parliament of the World’s Religions! Read more here. Press Release: Young Writers Take on the Theme of Power in KidSpirit’s Fall Issue! Power issue press release. More, here! Press Release: 2015 KidSpirit Awards Honor Young Writers and Artists Inspired by Life’s Big Questions! Press release about the 2015 KidSpirit Awards. Read more here, and here! Press Release: Young Writers Grapple with Boundaries Between and Within Us in KidSpirit’s Summer Issue! The Stranger issue Press Release. More, here! 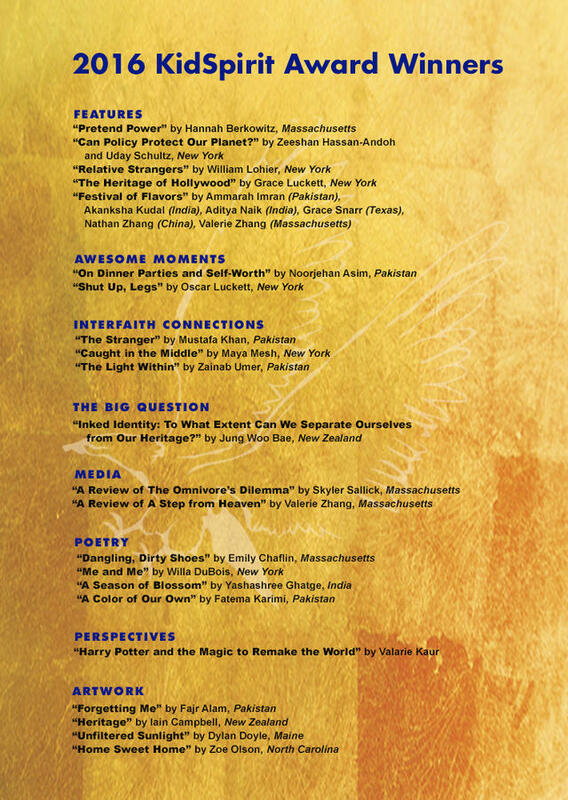 Video for the 2015 Wilbur Awards ceremony, produced by Andy Rawls, features teen writer Gracie Griffin reading aloud from her Interfaith Connections article “The Ultimate Superpower.” Watch the video here! Press Release: KidSpirit Wins a Wilbur Award for New Compilation Volume! Press release about receiving our third Wilbur Award. More, here and here! Press Release: Global Youth Take on Climate Change in KidSpirit’s Spring Issue! Climate Change: Tending Our Planet issue Press Release. More, here! Common Sense Media recommends KidSpirit! Read the review to learn why KidSpirit’s “cool platform [that] lets kids ask life’s deeper questions” earned four stars for quality! 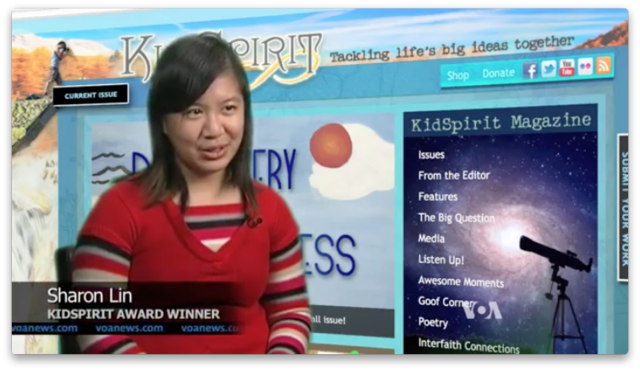 Voice of America religion reporter Jerome Socolovsky produced a video about the 2014 KidSpirit Awards, profiling award winners Sharon Lin, Akash Mehta, and others. Click to watch Online Magazine Gets Kids Discussing Big Questions! 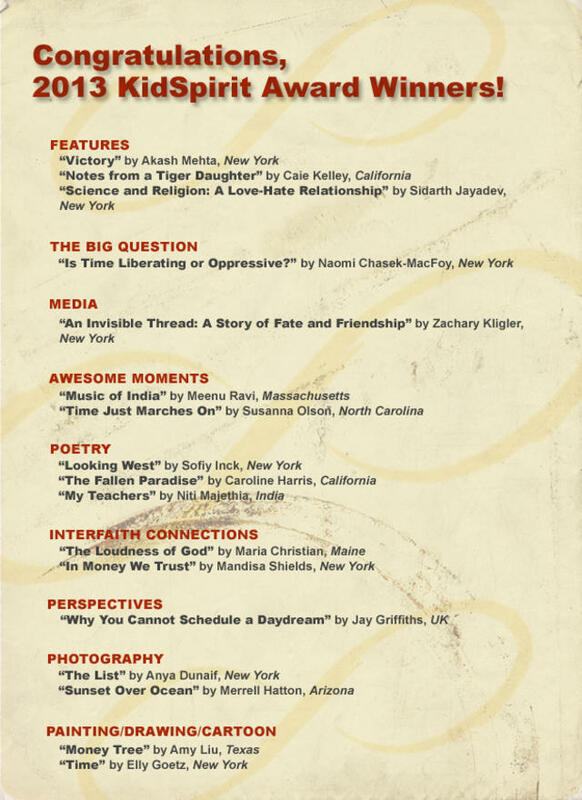 The Writer magazine highlights KidSpirit in an article about youth publishing outlets. Read A Headstart for Young Magazine Writers to learn about Ed Board member and contributor Misbah Awan, and for lots of great tips on submitting your art and writing to KidSpirit and other established youth publications! 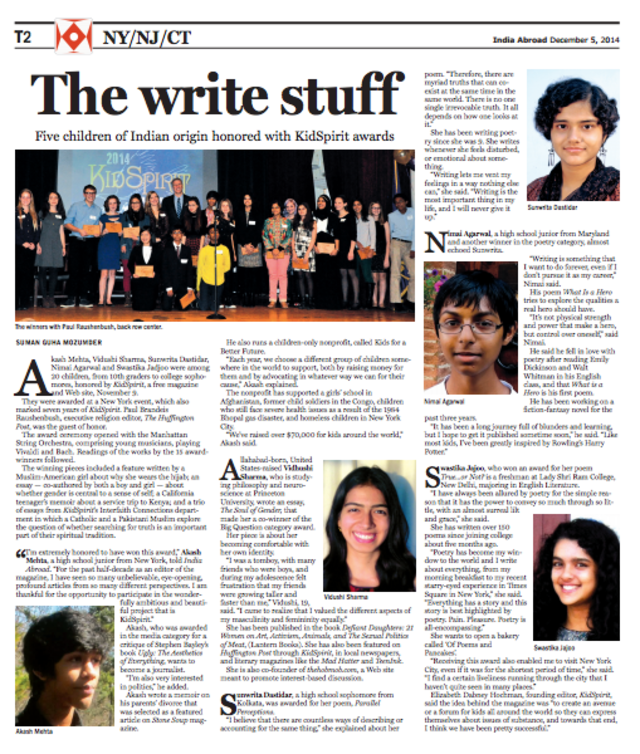 India Abroad profiles 2014 KidSpirit award winners with ties to India in The Write Stuff. Read the article (pictured below), published on December 5th, 2014, to learn more! Intersections International recognizes Ammara Mohsin, a member of KidSpirit’s Pakistan Ed Board. Ammara’s article, Rising Above Borders, is described and reprinted in a post by Rev. Robert Chase, entitled, Unexpected Threads. Read Rev. Chase’s article to learn about the connections KidSpirit forged with the help of Shanzae Asif, a college student in Lahore! Frederick News Post publishes an article about two KidSpirit contributors who won 2014 KidSpirit Awards, Nimai Agarwal and Melynn Oliver. Read Students win international honor exploring ‘life’s big questions’ in ‘KidSpirit’ to learn about how these two writers connected and established a Satellite KidSpirit Ed Board in their community. Veteran journalist Barbara Falconer Newhall pens a thoughtful and comprehensive overview of KidSpirit’s print compilation, The Best of KidSpirit Online, Volume III, on her blog, A Case of the Human Condition. Read KidSpirit Online: Where Young Souls Take On the Big–Old–Questions for fabulous art spreads from the volume, along with lengthy discussions of several articles! Spirituality & Health writes about KidSpirit in a feature article! Read about why KidSpirit is especially important at this time, “when young people need tools to meet the unique challenges they face,” and how the unique editorial process fosters global citizenship, a necessary for the future of the world. Read the full article today! 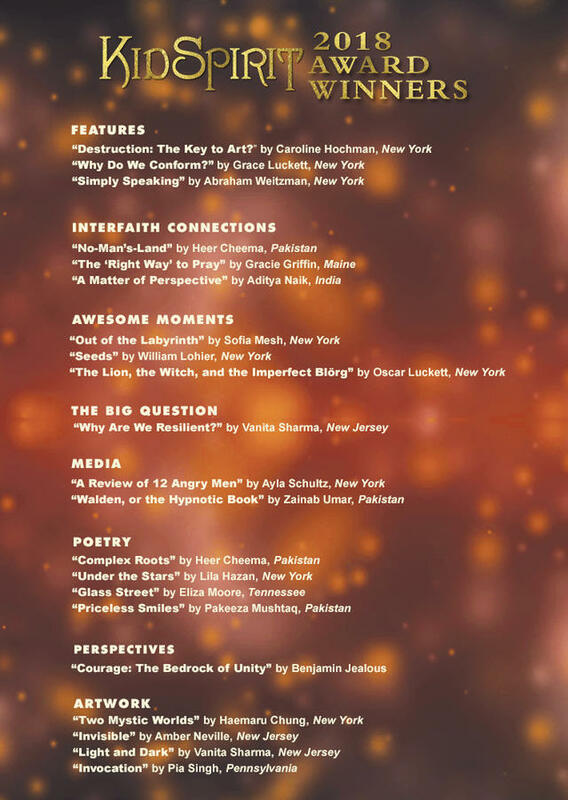 Press Release: Religion Newswriters Association awards KidSpirit an Honorable Mention for its Interfaith Connections column! Read more here! Press Release: Youth Writers Explore the Edge of Progress in KidSpirit’s Fall Issue! Press Release about the fall issue! More, here! Press Release: 2014 KidSpirit Award Winners Represent Global Youth Voices! Press Release about the 2014 KidSpirit awards. Read more here, and here! KidSpirit wins a Wilbur! 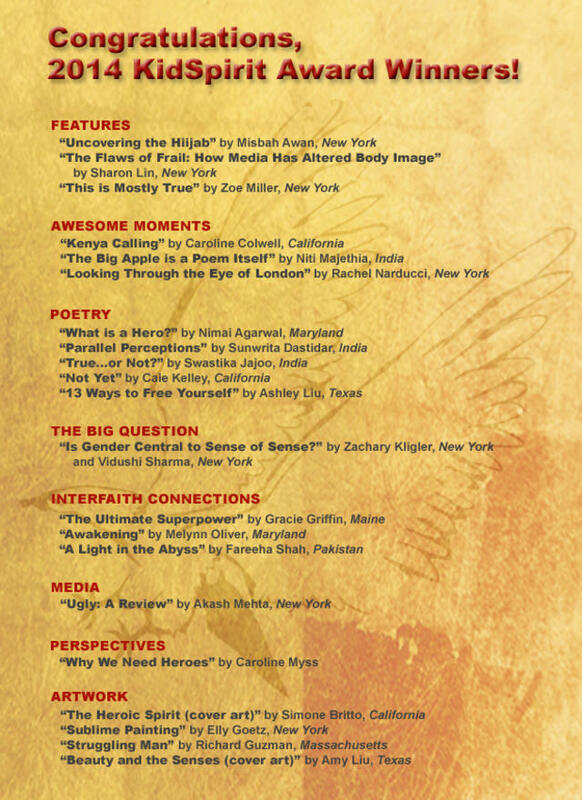 We are pleased to announce that KidSpirit has won a 2014 Wilbur Award for Interfaith Connections, our column for teens to dialogue about how their faith or wisdom tradition influences their view of life’s big questions. Interfaith Connections won in the Online Magazine Articles category, and was honored alongside work from such noteworthy organizations as the American Prospect, Princeton Alumni Weekly, CBS News, and the Huffington Post. You can see a full list of winners on the press release page. 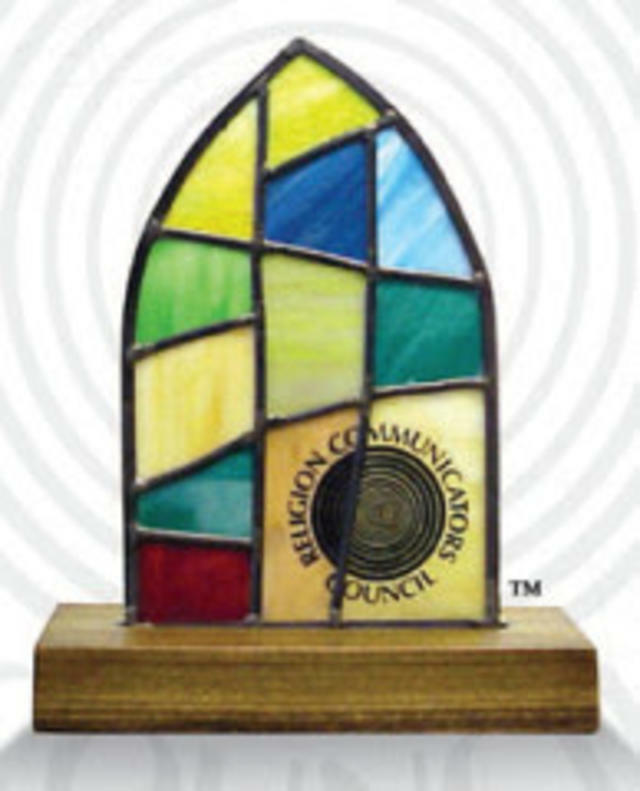 The Wilbur Awards are awarded by the Religion Communicators Council, an interfaith association founded in 1929. These awards recognize the work of individuals in secular media in communicating religious issues, values, and themes each year. Press Release: Youth Explore the Inner World in KidSpirit’s Spring Issue on The Psyche! The Psyche Press Release. PAW, Princeton Alumni Weekly, featured an interview with KidSpirit Founding Editor, Elizabeth Dabney Hochman in their March 5th issue. Read the piece to learn how KidSpirt, “a youth magazine that wrestles with big issues,” was formed! Press Release: Teen Writers and Artists Take on “The Nature of Truth” in KidSpirit’s Winter Issue! The Nature of Truth issue Press Release. Press Release: The Beautiful, the Ugly and the Sublime: KidSpirit Releases Fall Issue! Beauty and the Senses issue Press Release. Press Release: The Soul of Gender: Teens Around the World Lend Their Thoughts to KidSpirit’s Summer Issue! Soul of Gender issue Press Release. Rabbi Rami Shapiro interviews Elizabeth Dabney Hochman in his How to Be a Holy Rascal show on UnityFM radio. Listen to this engaging extended interview with KidSpirit’s founder and find out about what makes KidSpirit a cutting edge resource for youth. Congratulations to KidSpirit contributor and Satellite Ed Board editor Niti Majethia for being profiled by Amazing Kids! Read about Niti’s passion for writing and her experience contributing to KidSpirit and being honored at the KidSpirit Awards celebration in 2012. KidSpirit announces the winners of the 2013 KidSpirit Awards, chosen by the New York Editorial Board and brand new Satellite Ed Boards around the world! Read more about the winners and the international voting process in our press release. Press Release: KidSpirit Announces Youth Winners of 2013 KidSpirit Awards. 2013 KidSpirit Awards Press Release. KidSpirit is a Parents’ Choice Recommended Award winner! Fewer than 20% of the products submitted to the Parents’ Choice Awards program receive any level of commendation. KidSpirit wins an award in the Magazine category, following its 2012 Approved award in the Website category last year. Reviewer Teresa DiFalco writes of KidSpirit: “The articles are thorough and engaging and on topical subjects. Short essays in a feature called ‘Awesome Moments’ are well-written, and the regular book reviews are insightful… KidSpirit promotes smart prose on interesting topics. The material is interesting and rich; a good choice for teen readers.” Read more on the Parents’ Choice Awards site. Press Release: KidSpirit Magazine Wins Parents’ Choice Recommended Award from the Parents’ Choice Foundation. 2013 Parents' Choice Recommended Award Release. Odyssey Networks, in conjunction with the US Department of State, created 2012 Hours Against Hate, a campaign to help promote interfaith and intercultural understanding. Young people around the country were asked to spend one hour with someone different from themselves and write about it. Vidushi Sharma and Susanna Olson, two KidSpirit contributors, won a competition to present the most moving story of connection and had their experience documented in this incredible video! A great review of the Best of KidSpirit Online in young adult author Barrie Summy’s blog! Summy writes: “CLASSY. Everything about KidSpirit is classy. The magazine was a thoughtful, interesting, well-written read. The pages are thick and glossy, four color. If you know a pre-teen or teen who’s into writing, I’d recommend they submit to this magazine.” Read more here! The Deseret News features KidSpirit in a major feature article in October! Read about how the magazine has grown in five years, how a typical issue is produced, and see pictures of the Ed Board in action at a recent meeting. Click here for the article! 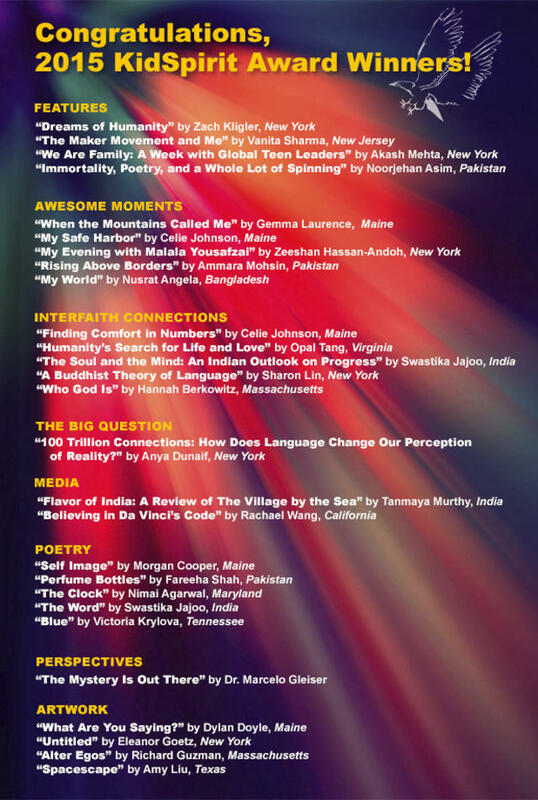 KidSpirit wins second place in the 2012 RNA Magazine Religion Story Layout and Design of the Year Award! See a complete list of winners on the RNA website. KidSpirit publishes the Best of KidSpirit Online, Volume II! Created and edited entirely by young people, the compilation volume presents teen writing on topics ranging from Conflict and Peacemakers, Humor, Creativity and Imagination, and Ethics and Morality. Adult contributors featured in KidSpirit’s PerSpectives columns include (among others) Dr. Marc Gopin, James H. Laue Professor and Director of George Mason University’s Center on Religion, Diplomacy, and Conflict Resolution; and Young Adult writer Adele Griffin, author of over 20 books for young people. The 115-page volume is printed in full color, and is entirely ad-free. Discussion guides for teachers and youth workers are included in the back, along with activities to get young people talking about the substantive topics covered in the volume. Press Release: KidSpirit Releases the Best of KidSpirit Online, Volume II, A Compilation of the Best Teen Writing on the Web. Press Release about the Best Of KidSpirit, Volume II. 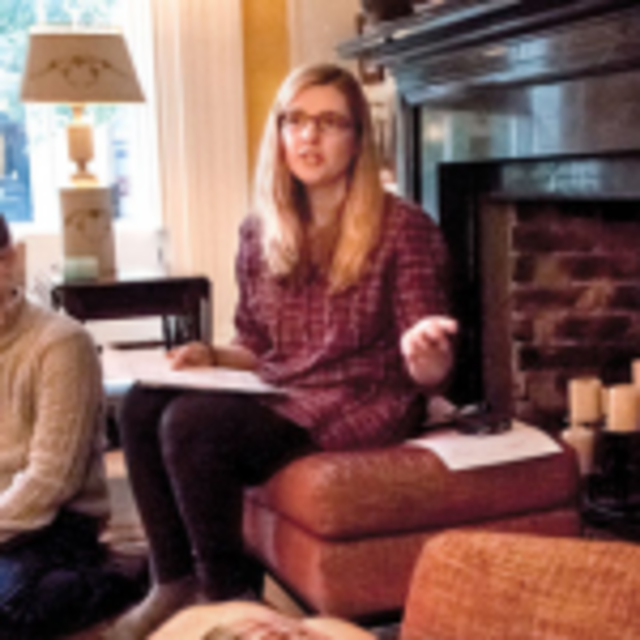 Founding Editor Elizabeth Dabney Hochman is featured in the October issue of The Interfaith Observer. In “The Internet — A Spiritual Haven for Youth?” she describes how KidSpirit has become a global forum effectively encouraging dialogue among youth about life’s big questions. Read Elizabeth’s article here. In celebration of another vibrant and exciting year of publication, KidSpirit is delighted to announce the winners of its 2012 KidSpirit Awards! The youth-led Editorial Board chose the recipients of the second annual KidSpirit Awards from over 70 original pieces of writing and art published at KidSpirit. Representing a cross section of diverse contributions, the winning works include original art, as well as pieces on ethics, creativity, and conflict from teens across the U.S., India, and England. The KidSpirit Editorial Board also chose Lama Surya Das, renowned Western Buddhist meditation teacher, scholar, and author, as KidSpirit’s Spiritual Elder Award winner. Author of the PerSpectives article “The Golden and Diamond Rules: Essential Jewels of Heart and Mind, Body and Soul,” Surya Das is the only adult recipient of an award. Press Release: KidSpirit Announces Winners of 2012 Awards. KidSpirit Press Release about 2012 Awards. Press Release: KidSpirit Online Wins Parents’ Choice Approved Award from the Parents’ Choice Foundation. Parents' Choice Award Release. KidSpirit writer Niti Majethia is honored by her school, RBK International Academy in Mumbai, India, for her award-winning work at KidSpirit! Congratulations to Niti. See what she and the rest of RBK are up to at the end of their school year this May in their RBKIA Newsletter 14th May 2012. KidSpirit is a finalist in the Association for Educational Publishers’ Distinguished Achievement Awards, which honor the best products and resources used by teachers, parents, and students. KidSpirit is a finalist in two Periodicals categories: Whole Publication Design, for its issue "Creativity and Imagination"; and is nominated twice in the Feature Article category for “You May Begin: A Look at Standardized Testing” by teen contributor Katie Hartman, and “Thriving Starts on the Inside” by Peter Benson, the late President and CEO of Search Institute and KidSpirit PerSpectives award recipient. KidSpirit adds this accolade to its finalist nomination in last year’s Golden Lamp Awards from AEP. Winners of the Distinguished Achievement Awards will be announced at a ceremony on June 5. For a complete list of winners, visit the AEP website. 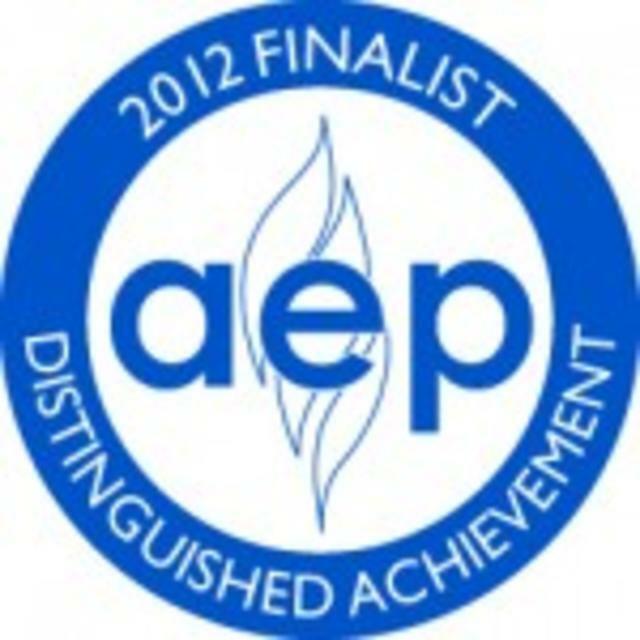 Press Release: KidSpirit Online Named Finalist in 2012 AEP’s Distinguished Achievement Awards. DAA Finalist Release. The New York Public Library hosts KidSpirit and five members of the KidSpirit Editorial Board in its TeenLIVE series. Ed Board members read articles they wrote along with work sent in by kids around the country, and answer questions about the experience of editing their peers’ work and contributing to the magazine. Read more on the New York Public Library’s website, and watch the video below. Q&A starts at 39:00. KidSpirit is now on the Huffington Post! With nearly five years of outstanding articles from teens in our archives, KidSpirit will be publishing some of the essays that appeared in our print and online magazine pages at the Huffington Post. Check out our first article, “Humility in Hinduism,” a reprint of a feature article that was published in the Rituals & Traditions issue, by former KidSpirit Editorial Board member Gautama Mehta. Gautama’s essay is featured on the home page of the Huffington Post’s Religion department. Future essays will be featured in the Religion and Teen sections. You can also keep up to date with new KidSpirit posts on HuffPo by joining our RSS feed. Thanks to the Interfaith Center of New York for mentioning our HuffPost article on the ICNY blog! KidSpirit wins a Wilbur! We are delighted to announce that KidSpirit has won a 2012 Wilbur Award for the Best of KidSpirit Online, Volume 1. The Best of KidSpirit won in the Youth Book category, and was honored alongside work from such illustrious organizations as 60 Minutes, Entertainment Weekly, CBS News, and the Oprah Winfrey Network. You can see a full list of winners on the website for the Wilburs. Press Release: KidSpirit Online Wins a 2012 Wilbur Award. Download here. The Interfaith Observer features a reprint of Elizabeth Dabney Hochman’s article for the Council for a Parliament of World Religions, including a fantastic submission from Gracie Griffin, a KidSpirit contributor in Maine. Press Release: Youth Share Views on Education in America in KidSpirit’s Spring Issue. Download here. An article by Elizabeth Dabney Hochman, “KidSpirit: Where Youth and the Spirit of Pluralism Converge” is featured in the newsletter and website of the Council for a Parliament of the World’s Religions. Press Release: KidSpirit Online Encourages Teens to Discuss Ethics, Morality, and Global Community. Download here. TweenParent features an essay by Elizabeth Dabney Hochman entitled, “Character Development: Are Kids Concerned About Cheating?” with reflections on how the Ed Board approached cheating in its issue on Competition and Achievement. Press Release: KidSpirit Announces New Facebook Page and Fall Issue on Creativity. Download release here. KidSpirit has been chosen as a finalist for the 2011 Association of Educational Publishers (AEP) Golden Lamp Award! The Golden Lamp Awards are the educational resource industry’s top honor, recognizing the best overall tools for teaching and learning. Four finalists are chosen in each entry category, representing 16 of the year’s most elite resources for teaching and learning. KidSpirit was chosen in the category of Periodicals along with publications from Highlights, Scholastic, and the National Association for the Education of Young Children. Kudos to KidSpirit writers! Anya Dunaif won a Scholastic Gold Medal for her article, “Spirituality and Transcendence: The White Light Festival” which was included in our Finding Your Spirit in Art issue, and a silver key for one of her images. Frequent contributor Sofiy Inck also won gold keys from Scholastic for one of her poems and short stories. KidSpirit and the Conflict and Peacemakers issue were featured in a full page, color article in the Christian Science Sentinel magazine last month! KidSpirit and its writers continue to gather praise for their outstanding work in this courageous issue. You can read all the articles published so far by going to the Conflict and Peacemakers Table of Contents. Download the article here. KidSpirit is featured in an article by the Charleston Spirituality Examiner, highlighting the recent Mom’s Choice Award, and KidSpirit’s commitment to promoting intergenerational and intercultural dialogue. KidSpirit wins a Gold from Mom’s Choice Awards®! Mom’s Choice chose KidSpirit as a top entry in the category of magazines for teens and tweens, one of only two magazines chosen in the category. 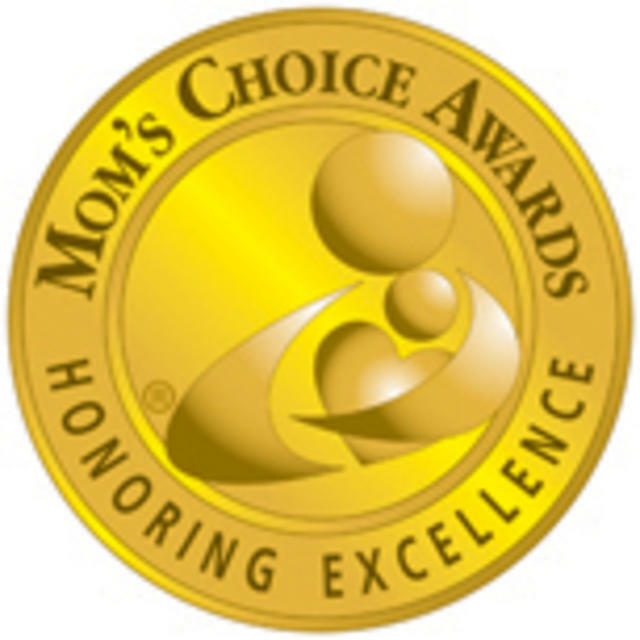 The Mom’s Choice Awards® (MCA) is an awards program that recognizes authors, inventors, companies, parents and others for their efforts in creating quality family-friendly media, products and services. See KidSpirit and the other winners at the Mom’s Choice website. 4YA: Inspiration for Youth Advocates interviews Elizabeth Dabney Hochman about developing a magazine for teens, and how to get youth involved in discussions, and writing and editing their own student magazine. Read the interview at 4YA. KidSpirit participated in the 2009 Mind and Life Institute's Educating World Citizens conference featuring His Holiness the Dalai Lama. All 2,000 attendees received a copy of KidSpirit Magazine. Interfaith Voices, the nation’s leading religion news magazine on public radio, featured Founding Editor Elizabeth Dabney Hochman and members of the Editorial Board in their June, 2009 show. Go to Interfaith Voices and jump to the second segment to listen to the interview. Brooklyn Independent Television featured KidSpirit in Neighborhood Beat, Episode 3 of its “Brooklyn Heights” focus. Watch the clip here. A noteworthy article about KidSpirit appeared in Spirituality & Health, including an interview with Elizabeth Dabney Hochman. Former editor Betsy Robinson directs readers to KidSpirit “if you wish you could share the kind of sustenance you receive from Spirituality & Health with the 11-to-15-year-olds in your life.” Read the full article. Grand Magazine, the magazine for grandparents, highlighted KidSpirit in its product picks. To see the article online, visit Grand Magazine and click on “Preview”; or read a copy of the article. Body+Soul featured KidSpirit Magazine on their website, Whole Living, as part of their Eco Gift Guide. Body+Soul editors wrote, “If kids were creating their own version of Body+Soul, it might look like this magazine… Deep-thinking youths curious about life’s big ideas will love this quarterly.” Download the pdf. The Center for Spiritual and Ethical Education (CSEE) released Good Things To Do: Expert Suggestions for Fostering Goodness in Kids, which includes our Founding Editor’s chapter, “Six Steps for Nurturing the Spirit in Young Adolescents.” Read more about the book and see a partial list of contributors. KidSpirit was featured in a spot on Boston’s Fox 25 television as one of a group of NAPPA winners who could bring “family fun” to the holiday season! Watch a clip of KidSpirit featured along with other winning NAPPA products. Kimberly Danek Pinkson, Founder and President of EcoMom Alliance, featured KidSpirit in her blog. EcoMom is a nonprofit organization dedicated to supporting communities of women helping to create a sustainable environment. KidSpirit was given a spread in the Park Slope Reader. 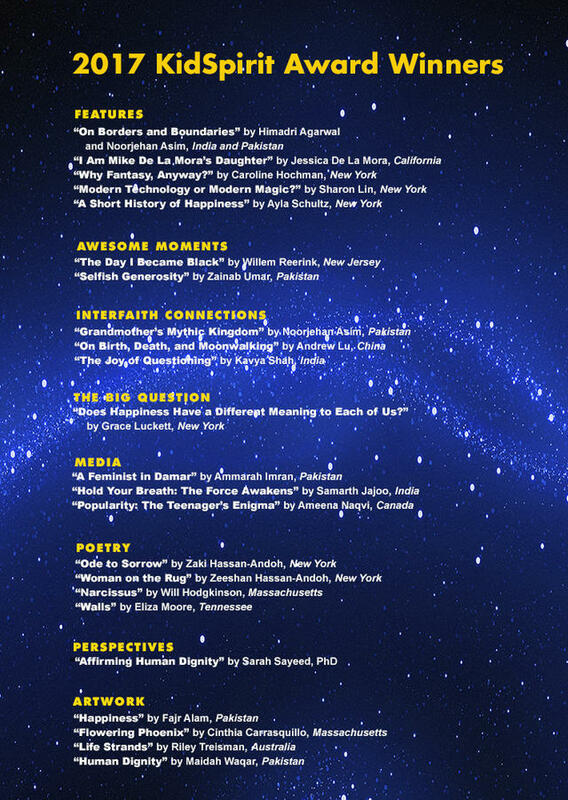 Park Slope Reader editors were so impressed by the outstanding writing of KidSpirit editor Elizabeth Berg that they included her entire article from Spirit & Materialism, “How Far Has Your Food Traveled?” Check out the Park Slope Reader’s spread! Kid Magazine Writers interviewed editor-in-chief Elizabeth Dabney Hochman about KidSpirit Magazine and the work that young people are sending in from all over the country! Read more. KidSpirit Wins a Gold! The National Parenting Publications Awards (NAPPA) awarded their 2008 media awards, and not only did KidSpirit Magazine place as a Gold winner, it was singled out as a NAPPA Top Pick in the Books and Magazines category, indicating that the judges considered it outstanding among the Gold winners. Click here to see KidSpirit on the parenthood.com website. 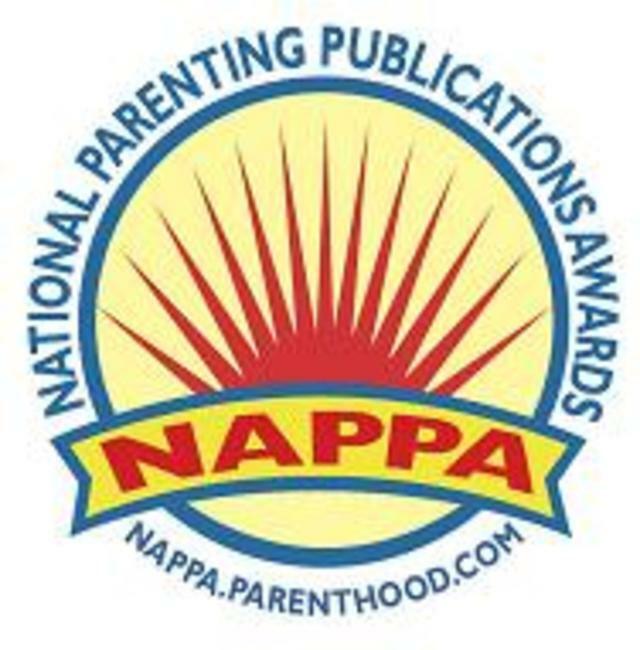 The NAPPA awards program is sponsored by Dominion Parenting Media and promoted in association with parenting publishers across the United States. One of the most highly competitive and selective kids media competitions in the country, the NAPPA awards are juried by judges who are industry experts with extensive professional experience working with children and parents. The judges are not the only ones to weigh in on the products, however — before awards are given, all the products entered are tested by both kids and parents. The NAPPA award showcases the best in books, CDs, and innovative products that help make parenting easier, more effective, and more fun. Family Circle Magazine recommends KidSpirit! Read what syndicated columnist Rosalind Wiseman has to say about KidSpirit in her Ask Rosalind column here or go to Rosalind Wiseman’s column online, click on August, 2008 and scroll down the page to her recommendation. Vail Valley’s TV8 interviewed Elizabeth Dabney Hochman during a visit to Colorado. Internet radio host Karen Humphries Sallick interviewed Founding Editor Elizabeth Dabney Hochman about the inspiration behind KidSpirit on her show, “Embracing the Journey.” Listen to the interview. The School Library Journal featured two of the members of KidSpirit’s Editorial Board in Bowllan’s Blog. Read their comments about being in on the ground floor here or go to the School Library Journal’s web site and select date June 16th, 2008 in the archive. The Center for Spiritual Development in Childhood and Adolescence at The Search Institute features KidSpirit on their web site. Read the article. 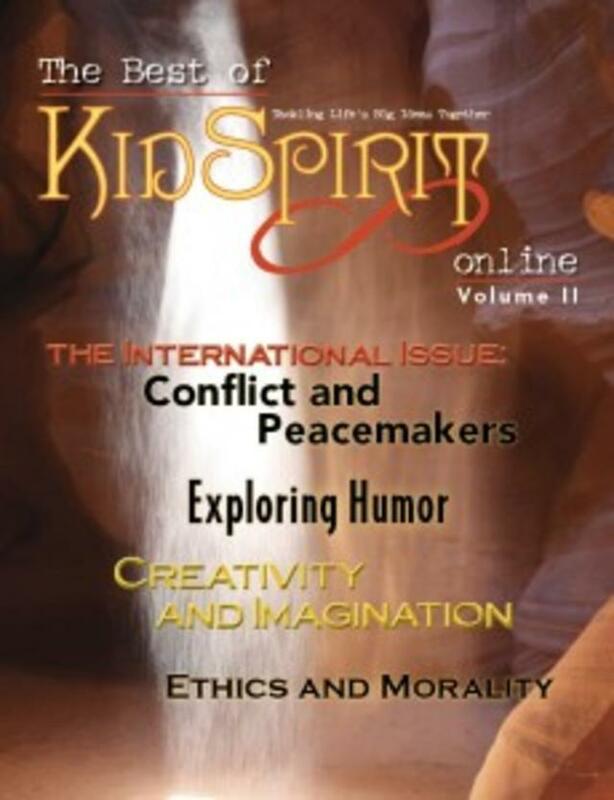 The Council for Spiritual and Ethical Education (CSEE) recommended KidSpirit Magazine in their newsletter, Connections. Read the piece. A new article, “KidSpirit Magazine: Youth in dialogue about Life’s Big Questions,” by KidSpirit Editor Elizabeth Dabney Hochman, appears in the Summer, 2008 issue of New Directions for Youth Development. This journal features the ongoing work of The Search Institute’s Center for Spiritual Development in Childhood and Adolescence and is published by Wiley Periodicals. Get information or order the publication online. In May, 2008, KidSpirit Magazine celebrated the publication of its Premiere Issue at a launch party in New York City. 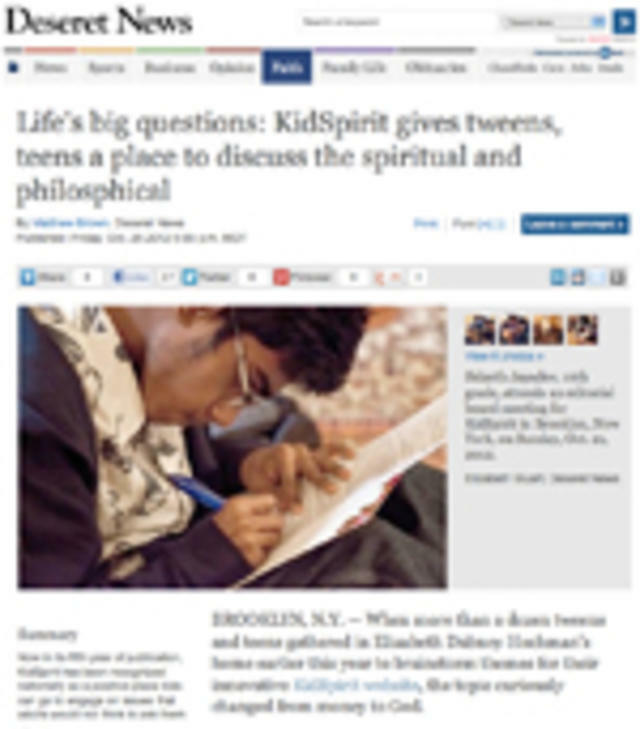 Read about KidSpirit’s launch and all-kid Editorial Board in Brooklyn’s Courier Life newspaper. The Brooklyn Daily Eagle profiled Editor Elizabeth Dabney Hochman and the process of creating KidSpirit. Read the profile. Many blogs covered KidSpirit’s arrival. Read a posting that appeared in Only the Blog Knows Brooklyn.